Sand pits have always been a favorite with kids. They play in sand by digging, sifting, building, pouring and exploring throughout time, which develops the muscle skills in the arms and the upper part of the child’s body. 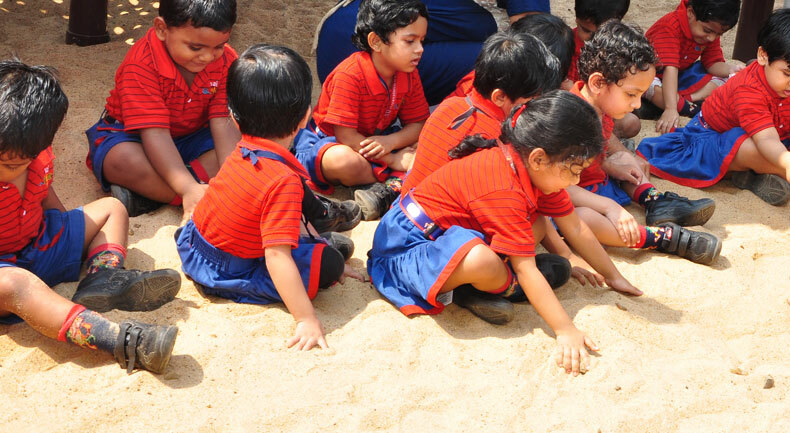 To develop the naturalistic, intrapersonal, kinesthetic and spatial skills of students, the sand pit at Angan is designed to unleash the creative imagination of the little wonders. As the children start getting comfortable with the sand, they have the opportunity to expand their creativity by drawing pictures in the sand and developing elaborate sand castles and other pieces of their imagination. Sand offers an opportunity to explore and experiment in a safe and inviting environment. Playing in the sand not only develops on the skills but helps the children to take creative and artistic leaps and bounds.